Please refer to our stock # 1092 when inquiring. 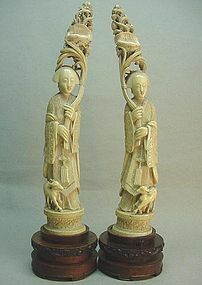 This pair of ivory carvings of ladies and lotus was completed in the mid 19th century. They depict aristocratic ladies holding stylized bouquets of reeds and lotus. Mythical deer are leaning over their robes. The carving is superb. Their traditional hairstyles, peaceful faces and detailed silk robes, playful deer and floral design bases really contribute to the overall quality of the pieces. They are 13 1/4” high (with hard wood base they are a little over 15 ¾” high), 2 ¼” wide and 2 ¼” thick. Aside from some hair line cracks and a missing branch from one lotus, they are in excellent condition.